Helix's FATTO NOA rushes to the end zone against Grossmont on Friday night. LA MESA – Junior running back FATTO NOA is no newcomer to the scene. But it seems many are only now becoming familiar with his name. 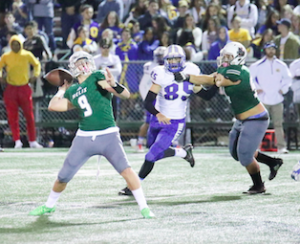 Elelyon “Fatto” Noa, a third-year varsity member, and the Helix Highlanders lit up the tote once again on Friday night against the visiting Grossmont Foothillers, 68-7, in the San Diego CIF Division I quarterfinals. The Scotties are usual Open Division title contenders, but a shortened field this season, had them matched up with a team they have now beaten in 23-straight contests. A rivalry that is only mythical in nature, Helix was making a statement, not to the Hillers, but to the rest of the county. 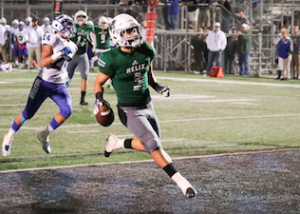 Now, Helix gets a matchup that could’ve been a top-notch semifinal in the highest division, pitting two county football titans when it faces second-seeded Eastlake on the road next Friday night. 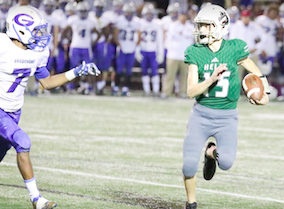 Those Titans will have their focus firmly on the Highlander backfield after Noa had another huge first quarter and rushed for 325 yards and scored four touchdowns in the first 12 minutes. Noa had touchdown scored of 76 and 69 yards, finishing with five scores before halftime. It’s not the first time this season the star and his offensive front has gone off before many have settled in their seats. Still, Noa is being recognized by the local highlight show as a candidate for newcomer of the year. While a truly worthy honor of his success and one he would appear to be a heavy favorite to be considered, the younger brother of Boise State linebacker EZEKIEL NOA entered 2018 with over 2,500 yards on the ground. He now has over 4,300 yards in this career, along with 39 touchdowns. These boys are poised for next year, too. Junior DELSHAWN TRAYLOR, quite possibly the county’s most overlooked two-way player, had two rushing touchdowns from his quarterback position, including a 69-yard touchdown run, and yet another interception, surely placing him among the county leaders in aerial thefts. Helix’s defense had four interceptions overall, along with two sacks, holding the Hillers to just 168 yards of total offense. Senior JACOB RAY had a pick, but so did sophomores JOSH MEREDITH and JAIDEN BROWN. The young duo has already started to shine this season. 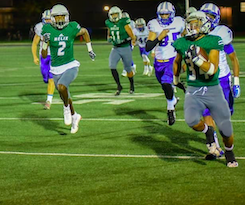 Highlander senior JOSHUA SHIELDS also had a pair of rushing touchdowns as Helix (8-4) racked up over 575 yards of total offense. Senior CHRIS RIVERA caught a 26-yard touchdown pass from Helix senior DANIEL AMON, who went 3-for-4 on the only Helix passes of the night. Amon, a former Eastlake Titan, came to the La Mesa campus this year after previously playing quarterback for the Highlanders’ next opponent. For whatever reason, Amon will have something to prove next Friday night. Junior KAMRYN BROWN had a 56-yard punt return for Helix. Grossmont sophomore running back ROBERT TUCKER had a 5-yard score on a nice touchdown drive, while junior receiver SKIP WALTOWER finished the second half of the season very strong, finishing with three receptions for 68 yards. “When we don’t play well we are not going to lose 10-7 with the number of plays that we run,” Grossmont head coach TOM KARLO said. “At one point this year, we had 13 starters out, so for us to come back from that and win a playoff game against a tough team like Madison on the road, with the circumstances that we had. 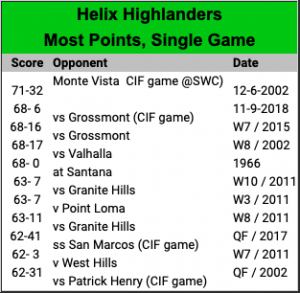 Grossmont did win a CIF game over Helix last century.